The competition took place at Blackwood’s tech-care inspired office at Dundee Street, Edinburgh, with competitors located as far away as Canada and Pakistan pitching via Skype to land the top prize. Volunteer judges from various care, private and public sector organisations provided contestants with direct feedback on the day and critique over the live stream feed. 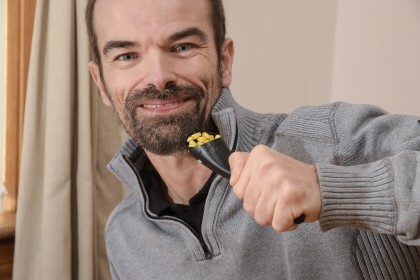 “We were blown away by some of the entries and it was extremely difficult to choose just one, but Grant and Mark’s S’up spoon is incredibly innovative and provides people with shaky hands the opportunity to eat independently with minimal spillage,” said Fanchea Kelly, chief executive at Blackwood. “We hope with our backing and the backing from our partners, that the design will go on to help many people and improve their quality of living. Speaking afterwards Grant, who has cerebral palsy, explained how the spoon, came about. He said: “One morning, my Mum was called away when she was feeding me, and this is when I had the lightbulb moment that I needed a spoon with a lid on it. A friend put me in touch with 4c Design and that was the real start of the S’up Spoon journey.